It's 13:29 in Raft River, USA right now. Coldwater R.A. - I-86, M.P. 18.8 A view of the current traffic situation. Cotterel, Idaho: Raft River - I-86, M.P. 4.0, 12.6 miles away. Idahome, Idaho: I-84, M.P. 237, 15.1 miles away. Heyburn, Idaho: I-84, M.P. 211, 24.9 miles away. 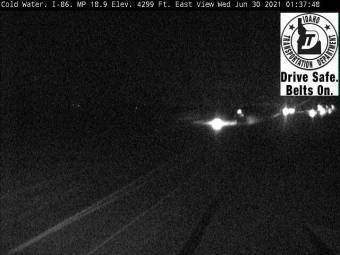 Connor Creek, Idaho: Conner Summit - SH-77, M.P. 12.5, 25.7 miles away. Juniper, Idaho: I-84, M.P. 263, 33.5 miles away. Arbon Valley, Idaho: I-86, M.P. 50.5, 38 miles away. Springfield, Idaho: Sterling - SH-39, M.P. 27.5, 43.7 miles away. Pocatello, Idaho: I-15, M.P. 68, 44.6 miles away.